“We must publicly condemn those Jews who meddle in the White House and betray Eretz Yisrael’s interests” stated Zionist Deputy Education Minister Rabbi Meir Porush in reference to left-wing lobbyists in Washington, such a J Street. 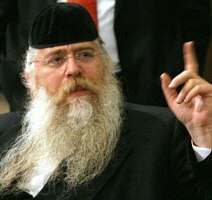 Porush condemned those who are working to persuade US President Barak Obama to remove Jews from their homes in the West Bank. He emphasized that the Israeli left is there to assist them in their efforts, and former Labor MK Colette Avital, who was the Consul-General in NYC, is their official advisor, working to advance their left-wing political agenda. Rabbi Porush stated that J Street is motivated by “self-hate”, the daily HaMevaser reports, spreading beyond the borders of the United States, to the UK for example, operating under the banner Jews for Justice for Palestinians, working in earnest to have Israel Ministry of Tourism ads removed, working against Israel’s interests. They claim the ads must be removed because the map of Israel shown contains the West Bank, which is contrary to their agenda. He blames them for the damaging reports against Israeli soldiers in the foreign media, the result of their false accusations. He goes on to explain the source of the ‘tuma’ is undoubtedly the Israeli Peace Now organization, now engaged in an unprecedented battle to remove yishuvim from Yehuda and Shomron. He adds that Peace Now is the ideological source of the lobbyists abroad, such as J Street, adding it is a known fact that Peace Now enjoys funding from a number of foreign governments, some hostile to Israel. Rabbi Porush conveniently confined his comments to secular Jewish groups, whom he can accuse of “self-hate”. However, he chooses to ignore the Orthodox anti-Zionist world, whose leaders are also “betraying” the Zionist state’s interest. See Kiryas Joel mayor Abraham Wieder’s letter to President Obama, in which he supports the President’s “noble efforts” to stop the “senseless bloodshed” in the Middle East. He says that the Zionists state stands in contravention of the Almighty’s decree, and that the bloodshed is due to the state’s efforts to hold onto a piece of land occupied by its enemies. No one can claim that Orthodox Jews, who believe that saving lives is of the highest priority and supercedes the commandments of the Torah, are self-hating. Anyone who has visited traditionally religious and Hasidic communities knows the tremendous amount of charity work and concern for fellow Jews that exists. So when we speak out against the militant Zionist settlers, it is that same concern for our fellow Jews that motivates us. Note also, Rabbi Porush, that there is nothing new about our statements that the settlers endanger Jewish lives for the save of a false ideology. Rabbi Elazar M. Shach, whom you respect highly, said the same thing many years ago. The opposite – that showing strength and not budging will only lead to further loss of life – is the truth, according to Rabbi Shach. The settlers are endangering our people. Jews live in a confusing time, a time when one can see very religious Jews such as Rabbi Porush speaking out against the dismantling of the settlements. We are told to cry for the poor Jewish homes that are being cruelly uprooted, the yeshivos and shuls that will be plowed to the ground. But we are being told to forget the fact that the settlers are there for a specific purpose. There is a reason why they do not live in New York or Chicago or London. They are there to fight, to anger the Palestinians, and thus to put their lives – and all Jewish lives – on the line for the sake of their ideals. And the Brisker Rav taught us that this is wrong. These people are the most dangerous rodfim – pursuers and threats - to the Jewish people. We should rejoice when something is finally being done to hold them back and dislodge them from their positions. Of course, we know that even this is not enough, and that the entire Zionist state, as a rebellion against G-d, cannot ultimately be successful. The Torah teaches us that Jews will not be safe as long as it exists.